Sometimes it’s a real challenge to get celebrity interviews. Years ago, I had to fly down to Los Angeles to talk with Donald Trump on his golf course. 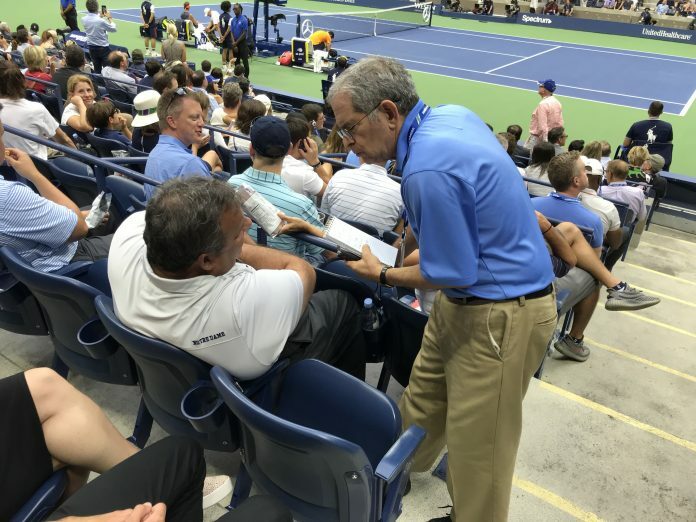 There was the time I had to figure out how to get past sailors and soldiers in order to talk with Bill Clinton at the edge of Wimbledon’s Royal Box, and a year or two later, how to navigate past a cadre of Secret Service agents to again talk with Clinton – this time at the US Open. It’s fun, and a bit of a game. I had to call on all my patience in order to talk with Hillary Clinton in the US Open President’s Suite, and I chatted with George Bush Sr. and Jimmy Carter in the halls of Ashe Stadium. Newt Gingrich, the former Speaker of the House went on and on comparing tennis with politics. Getting to Trump critic Michael Avenatti at this year’s Wimbledon was a two-day, semi-miraculous operation. But today it was easy – almost too easy. I saw a big man a short way from me. Just seven yards down from my seat in the press section was a 2016 Presidential candidate. Former New Jersey Governor Chris Christie, who was with his wife and son, was hard to miss. Colleagues immediately began to offer me a buck or two if I’d interview him. I wondered whether I should. They chastised me when I didn’t approach him right away. I took my time. I knew President Trump would not be coming. In fact, his suite had been completely empty for four or five days. I wondered why. One of my far too cynical colleagues suggested I somehow compare Christie’s Waterloo moment, the so-called “Cone-gate” (when he cone-blocked lanes on the New Jersey turnpike) with the other “Cohen” dust-up – Michael Cohen’s serious issues. No way, I thought. I did think of New Jersey’s greatest tennis product, Althea Gibson, and a Wimbledon item we published in 2016. We noted that “a voice in the press room called out, “Jerzy’s collapsing,” which had nothing to do with the the faltering fortunes of the campaign of New Jersey’s Chris Christie, and everything to do with the struggles of Poland’s faltering Jerzy Janowicz.” Then Rafa took a medical time out and I knew it was my time – and so the former Governor and I talked. Governor Christie, the great Althea Gibson was on the New Jersey Board of Athletics for 10 years, and now the US Open is going to build a statue of her which will be unveiled next year. What are your thoughts on this great African-American trailblazer? She’s amazing. We actually have tennis courts in Newark dedicated to Althea, and a tennis program that I helped start there, that’s running right now is in Althea’s honor. She was an amazing pioneer, she’s in the New Jersey Hall of Fame. We’re really proud of her and I think it’s a great decision by them to put a stature out here. She broke the color barrier at the Orange [New Jersey] tournament, which used to be so important. What quality did Althea show as a pioneer? First of all, she had incredible class. She’s someone who has represented our state and the sport incredibly well with her sportsmanship, and also, she was an extraordinary athlete. All of those things are great memories of Althea Gibson. The great Billie Jean King told me recently that every generation has to fight for freedom and democracy. Does that ring true to you? It absolutely does, if Billie Jean said that. Ronald Reagan said something similar when he said that freedom is only one generation away from extinction. We all have to be really cognizant of that in our country and stand up for the institutions – the Constitution, our freedom of speech and the press. They all are so important. Do you think that’s under pressure now? I just think it’s a normal tension the goes on, it’s just louder, because this president is louder than most. But I don’t think it’s any different than other times in our country. There’s always a healthy tension between the press and people in public life. Those of us in public life have to understand that the press has a job to do, and as long as they’re being fair, even if they’re being critical, that’s part of what goes along with the business. You just think that President Trump is louder than the other Presidents of the United States? Oh yes, and I think we are in a different time. Our phones and all the social media makes it a lot easier to be louder. And what is your favorite quality of this incredible sport? The athleticism is extraordinary. You see that when you watch the balls that Nadal and del Potro are able to get to. And the pace on those balls. It’s extraordinary to watch. Del Potro is such a big man, but he’s a gentle soul, What does that tell you? It tells me that he’s someone who knows who he is and that he is a man who is comfortable inside his own skin. You can say the same thing about Nadal. Rafa is a fiery character. Although he’s different from del Potro from a personality perspective, he’s also incredibly composed and comfortable in his own skin. Rafa’s known for his relentless intensity, his fighting spirit. I watched him lose that first set 6-0 in his last match [that last 4:49 against Dominic Thiem] and wondered where he was going to go. To see him come back and win was amazing. FRESH FACES: ARE TENNIS’ FABULOUS, FEARLESS TALENTS POISED TO TAKE OVER? The award-winning Inside Tennis, now in its 39th year, is published seven times annually and is known for its creative, cutting-edge content and superb photography. The San Francisco Chronicle called Inside Tennis "the most informative tennis publication in the English-speaking world," and tennis commentator Wayne Bryan said the magazine is "No. 1 in writing, insight, class, heart and love for the great game."